Escape the hustle and bustle of everyday life and come experience the serenity of Kiawah Island. Kiawah Island is a wonderful island that you won’t forget! In March 2016, Conde Nast Traveler readers voted Charleston, SC as the #1 City in the World and Kiawah Island, SC as the #2 Island in the United States. Kiawah, named after the Indians who lived here in the 1600’s, is committed to maintaining a balance between the resort community and its fragile natural surroundings. Visitors and residents all participate in maintaining the incredible beauty of this iconic destination. The beautifully manicured and natural landscaping, wildlife, over 30 miles of bike trails, 5 golf courses, parks and pristine 10 mile long beach, make Kiawah Island the perfect spot for the ultimate vacation. 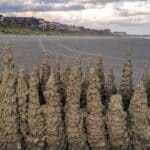 Looking for a relaxing walk on the beach? Kiawah’s Beachwalker Park includes a short stretch of Kiawah’s Beach where everyone can access the sandy beach. With lifeguards manning the beach from March through October, parents can allow their children to take to the waters without worrying about safety. There is a picnic area complete with grills so you can create your favorite barbecue to enjoy. The dressing area and clean restrooms all help to make the beautiful Kiawah Beachwalker Park more attractive to visitors. The ramp and boardwalk are both handicap accessible so everyone can enjoy the beautiful sights this stretch of sand and water offer. Per Person Admission: November through February is free, March through Labor Day is $7, Summer Monday-Friday is $7, Summer Saturdays and Sundays are $10, September through October is $7. From March through October, you can rent full-service beach chairs and umbrellas to make your time on the beach even more relaxing. Kiawah offers 10 miles of pristine beach. The sand is hard-packed so you’ll often find families biking down the beach in the direction of the wind. Unlike in Beachwalker Park, there are no life guards, no outdoor grills and very few handicap ramps. Bathroom facilities can be found at the Straw Market and at the boardwalk access between Windswept and Mariners Watch. Single speed bikes, made for the beach elements, are easy to rent for the day or for the week. To see the very best that Kiawah has to offer, bike to the east end of the beach. Plan your ride for morning or late afternoon, when the tide is going out and the wind isn’t too tough to bike with. Near the end of the island, the sand gets soft so it is best to park your bikes and continue on foot. Near the end of the island you can see different types of wildlife – many different types of birds and fish. Cool your feet in the creeks. Herd small minnows as you walk, squeeze pluff mud through your toes and experience different textures of sand through your toes. This is also a good spot to collect a sand dollars and to see what the surf has retrieved from the ocean. At the very end you should be able to spot a sandbar full of Brown Pelicans. Allow roughly 3 hours and be sure to bring sunscreen and water. From March through October, you can rent full-service beach chairs and umbrellas to make your time on the beach even more relaxing. If you want to learn a little about Kiawah and its natural heritage, start at the Night Heron Park Nature Center where knowledgeable guides are eager to answer your questions and acquaint you with Kiawah’s wild side. Opening daily at 8:30am, the Nature Center is located in Night Heron is the heart of Kiawah’s Nature Program and is a great first stop to get information on recreation activities and recent nature sightings. Inside you’ll see displays with many of the local animals including turtles, fish, and alligators. The folks at the Nature Center will teach you about Kiawah’s tidal creeks, maritime forests and ponds, and the island’s huge variety of plant and animal life. 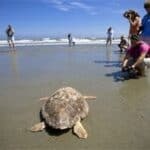 In addition, you can find out about Kiawah’s loggerhead turtles, and 220 species of birds, including ospreys, hawks and bald eagles. Kiawah Island, besides being a fabulous beach destination, is also a sprawling golf resort with plenty of golf courses to enjoy. It is the perfect destination for those who want to golf where the pros play. 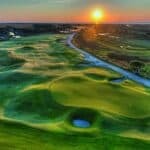 Kiawah is only the fourth course in the U.S. to have hosted every major American PGA event, including the 2012 and 2021 PGA Championship, and The Ryder Cup. There are five legendary courses, designed by the legendary architects: Pete Dye, Jack Nicklaus, Tom Fazio, Gary Player, and Clyde Johnston. 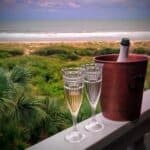 Kiawah Island is also a popular destination for weddings, honeymoons and private events. Visitors can find accommodations at The Sanctuary Hotel, in a vacation rental villa or, for absolute privacy, in one of many luxury homes. Looking for a place to hold important business meetings? The clubhouses and hotels on Kiawah have five star conference rooms and facilities to make that possible. 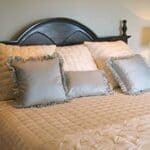 Although most accommodations on Kiawah feature full-size kitchens, you’ll occassionally want to escape the kitchen and dine in the many fabulous restaurants on the island. Many of the fine dining establishments are located inside the golf club houses, a few in the Sanctuary Hotel, as well as several options in the nearby Freshfields Village or just off the island. Along with over 40 miles of bike trails, there are five world-class golf courses, two racquet clubs, a recreation center with a playground and nature center, and 10 miles of the most beautiful beach on the Atlantic Coast! 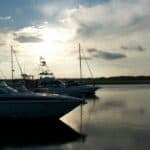 Other activities available on Kiawah include boating, sailing, surfing, canoeing, kayaking, shelling, fishing and plenty of wildlife viewing. Be sure to rent bikes and beach chairs! If you are feeling adventurous, take a kayak, canoe or a stand-up paddle board and paddle away through the Tidal creeks and salt marshes around the Kiawah River. There are excellent group tours designed for families, with varying ability levels. If you prefer a private tour of Kiawah’s marsh and river, consider a tour with Tidal Trails, or consider a tour with Ralph Earhart (who, literally, wrote the book) of Kayak Charleston. Located just off the island is Bohicket Marina. Aside from a very picturesque marina, it features a wonderful restaurants and shops. Arrange a special charter in advance to surprise your family. Bohicket charters and activities include boating, sailing, kayaking, fishing and dolphin viewing tours. 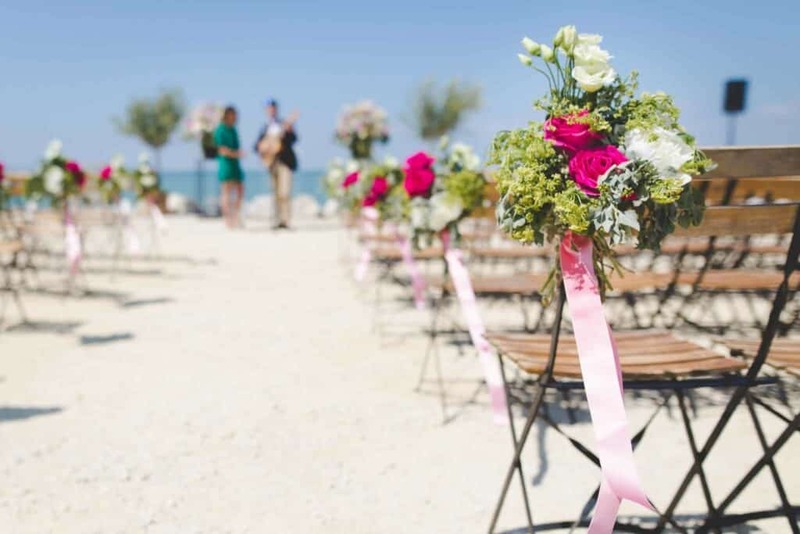 The world’s number one bridal magazine, Bride’s, named the Charleston area, highlighting Kiawah Island, as one of the world’s best post-wedding destinations for honeymooning couples. Kiawah is also rated as having the “Second Most Romantic Beach in America” by National Geographic Traveler. Be sure to check out our “Vista” and “Escape” villas – these are the perfect accommodations for honeymooners and romantics! During your vacation, you’ll want to spend at least one day in Charleston. Only 19 miles from Kiawah, Charleston is the home to many historic homes, buildings, museums, art galleries and historic churches making it a visual delight. Delightful restaurants, all allowing very casual dress, abound in peninsular Charleston. And a visit to Charleston wouldn’t be complete without attending one of the important festivals or events happening all year round. A good example is the famous Spoleto Festival USA as well as the Holiday Walking Tour that makes Christmas in Charleston simply amazing. Art lovers won’t want to miss the many Art Walks held throughout the year with numerous participating galleries. Be sure to be in Charleston on a second Sunday of any month – the main part of King Street is closed to traffic and the local vendors set up their foods and entertainment in the streets for all to enjoy. Whether you take a horse drawn carriage tour or just wander through our lovely city, you will have a truly memorable experience. 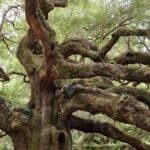 Angel Oak is an absolute must see for anyone visiting Kiawah. The tree is estimated to be in excess of 400-500 years old, stands 66.5 ft. Angel Oak is thought to be roughly 1,500 years old. The tree is conveniently located between Kiawah and Charleston, so be sure to include it in your travel plans. If you are interested in receiving a list of real estate for sale on Kiawah and/or an update on the Kiawah Real Estate Market, contact Kay Halsey, Sales Executive at Carriage Properties Real Estate, [email protected], Office: 843.266.9885, Mobile: 843.729.4376.